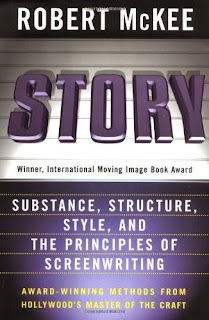 Over the last few days, I've been listening to the audiobook version of Robert McKee's Story: Substance, Structure, Style, and the Principles of Screenwriting. Although I have no current plans to write a screenplay, I've been told by many people that this is an excellent resource on story writing in general. I find that when I write stories, conflict is one of my biggest problems. When I sit down to brainstorm and plot out a story, I might envision four or five problems that the protagonist will need to deal with during the course of the story. Invariably, when I sit down to write that story, I find that my protagonist has out-thought me. For example, what was supposed to be a character with a broken-down car in a bad part of town suddenly becomes a nervous wait for the tow truck... or worse, the character sees a police station across the street. Many of my stories, as a result, wind up being incredibly dull affairs. I don't know exactly why this is happening to me, but it seems that McKee does. In the book, McKee says that any scene you write that isn't a Story Event should be removed. I'm paraphrasing a bit, but he says that for something to be a Story Event we need to see at least one value in the character's life change state (from negative to positive, or positive to negative) through conflict in a way that has a meaningful impact on the character. Usually, a meaningful impact is one that affects the character's inner life (feelings, thoughts, worldview), personal relationships (causes a love relationship of friendship to change), or their fortune in the world. McKee suggests asking yourself for every scene: What value is at stake in my character's life at this moment? How is that value charged (positively or negatively) at the start of the scene? How is it charged at the end? If there is no change in the value, ask "Why is this scene in my story?" If a value hasn't changed, nothing meaningful has happened in the scene. It is a non-event. Over the course of the entire story, you should see a meaningful, absolute, and irreversible change in the character's life. McKee suggests that every time your character takes some action toward the story goal, that there is a reaction in the character's situation (specifically, the character's inner life, relationships, or outer world) that is more powerful than the character expected. I think it's this "charged value" part of the puzzle I have been missing. For example, in a story I recently worked on, an astronaut learned that the computers controlling her spacecraft had been hacked by agents of a foreign government. They tried to use this as leverage against her government but failed. They turned off all the systems on her spacecraft and left her to die. She was able to figure out a way to reboot the systems and keep the hackers out. In McKee's terms, this is a non-event. No value in the character's life changed. She didn't go from alive to dead, rich to poor, etc. She left the scene in precisely the shape she entered it. The only thing that changed was the computer, from "compromised" to "safe" again. To add a charge to this, I might have made it so that when the computer shutdown, there was a short burst of the rockets that took her off course. When she finally gets the computers working, she learns that the spacecraft is now so far off course it can't reach its destination with the available fuel - and it can't return to Earth either. Her mission and her life are now both at risk. Two emotionally charged values have flipped (mission success to failure, safety to certain death). I expect that I'll be sharing more as I work my way through the rest of this book. If you're struggling with your writing as I am, you might want to follow the link above and pick up a copy of the book for yourself.